On the outside, San Francisco’s Smitten Ice Cream it looks like any other cute, local dessert shop with its bright decor and cheery lighting. But catch sight of the swirls of fog wafting from the industrial mixers inside, and it’s clear there's a whole lot of science happening here. It took one ice-cream obsessed entrepreneur, her life savings and the help of a professional engineer to perfect a single scoop of Smitten's ice cream. The ice cream makers are so high-tech that owner Robyn Sue Fisher keeps six more engineers on contract to make sure they keep churning out the good stuff. "I threw everything I could at it," said Fisher, 34, who helped invent Smitten's proprietary ice cream maker, known as the Brrr. "It’s an intense looking machine." Since opening in 2011, the shop regularly has had lines out the door and received high praise from local food writers. In March, the Hayes Valley shop sold 16,000 dishes of ice cream (a small size costs $4.95) alone. The secret to Smitten's success -- and the machine's -- is liquid nitrogen. That substance, a kind of extremely cold compressed liquid air, chills the metal ice-cream mixing bowl to minus 321 degrees Fahrenheit. Fisher explains that ice cream made at this super-cold temperature is much smoother than the regular stuff because ice particles can't form within it. Those particles are what can make the frozen treat feel gritty. Of course, liquid nitrogen is not new to the ice cream business. Restaurants have been using it for years as a kind of dining-meets-theater spectacle. But Fisher created a machine that takes the delectable treats to scale and has built a successful business around it. Scoops made with the Brrr are some of the densest, smoothest ice cream sold in any shop in the country. "They scrape so much that nothing ever sticks," Fisher said of Smitten's ice cream machines. "That makes our mixer really unique and that’s one of our patents." The store also uses almost entirely locally sourced, organic ingredients and seasonal flavors. And people are gobbling it up. While Fisher won't reveal precise sales information, she said Smitten's revenues rose by 50 percent last year and she is now planning to open additional locations. The shop's popularity is the result of Fisher's long journey through the world of ice cream and engineering. After she graduated from college, she worked, unhappily, as a management consultant while fantasizing about a more creative calling as an ice cream maker. When she couldn't find her ideal scoop anywhere -- even after road-tripping across the country in search of it -- she decided she would invent it herself. She was especially interested in using liquid nitrogen, and enlisted a retired engineer to help her with the machine's construction. For more than two years they worked on the design of a prototype. Once she had a working machine, Fisher started pulling around the first machine on a wooden wagon, to sell scoops to people on the street. After her ice cream caught on, she started hanging out with other food trucks in San Francisco and got the notice of companies like Google, which asked her to cater some events. From there, she was able to get enough money together to open the first Smitten shop with seven employees just over two years ago. 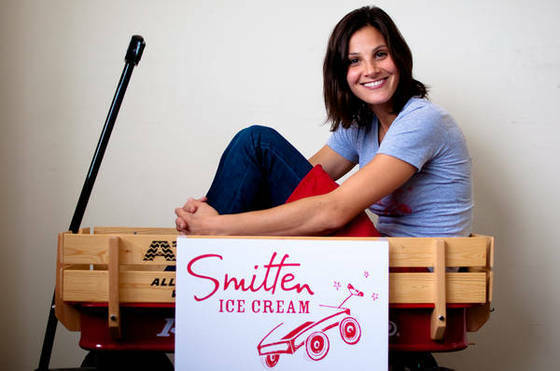 Smitten's success is nice, but Fisher said she's not in it for the money as much as for the ice cream. She even turned down an offer for $50,000 to sell one ice-cream machine. "We get offers all the time to buy machines," she said. "It's not worth the quick cash. We are not franchising because I care more about growing well than growing fast." Robyn Sue Fisher and her first 'store' -- a wooden wagon she used to pull around her ice cream machine and sell scoops on the street.